September | 2015 | WorstPlans.com updates every Monday! When a person searches for something using an online search engine, their general expectation is to get a vaguely useful answer. However, I checked the blog stats recently, and someone apparently searched for “cutting a poster for carrying” and was directed to the “butterfly” poster design post (https://worstideas.wordpress.com/2015/05/04/poster-tips/). Fig 1: Some unfortunate person searched for “cutting a poster for carrying” and was referred to this blog. But, this can be fixed! Now, future individuals who want to know how to cut a poster for carrying will be able to consult this page. If you need to “cut a poster for carrying,” first fold it into an octagon to make the primary base. Then fold the outsides to the middle—you’ll know you’ve done this right if it makes a transverse diamond shape. Next, fold the middle sides in, and then fold the entire diamond length-wise. Flip it over once, and repeat the process. Then fold in the protruding rhombus lobes and perform a reverse inside fold. Next, fold the base lengthwise and tuck the tail in between the two sides. Finally, fold the entire assembly length-wise, pull out the tail section, and fold the head to make a beak. Now cut it in half. Voilà! Fig 2: Final result of the poster, after cutting it for carrying. I never believed the disdain that my cat had for my poor time management skills, until I watched this one shocking video and applied this one weird trick that doctors hate. Procrastination consumes billions of hours of otherwise-productive work every year. If there was a way to even reclaim a tiny portion of this lost time and direct it toward useful pursuits, society would be immeasurably improved. In particular, now that Internet access is required for many types of legitimate work, it can be difficult to maintain focus on (say) doing one’s taxes when there are thousands of un-viewed cat videos staring directly at you from your browser’s “Unwatched Cat Videos” tab. In this specific plan, a household animal will be trained to recognize the difference between legitimate computer usage and procrastination (Figure 1). Fig 1: Filling out spreadsheets or tax forms (left) would count as legitimate computer usage. This is visually obviously distinct from wasting time on a video clip site (right). Even the most technically un-savvy dog or cat could be trained to discern when a user is watching a video on the computer. Next, after the household animal (potentially a dog or cat, or perhaps a bird that could follow the user around at all times, parrot-on-shoulder-style) has been trained to identify legitimate computer usage vs procrastination, the animal will be trained to harass the procrastinator in some way whenever they procrastinate. Generally, this would presumably involve biting, stinging, or beak-ing, but the universe of possibilities is nearly endless. Fig 2: This angry bird could peck the computer user whenever procrastination is detected. Fig 3: For severe cases of procrastination, nature’s deadliest animal could be employed to correct the sub-optimal behavior. PROS: An interesting reversal of the usual meaning of “animal cruelty” may help save our nation from Internet-related productivity loss. CONS: May result in a “Planet of the Apes”-like scenario in which we regret arming animals and giving them dominion over us. Whoops! Save hours on any teleconferenced meeting with this one weird tip that will drive you to the brink of gibbering insanity! Teleconferencing can be a useful tool. However, it can also make it easy to schedule endless meetings where 90% of the participants have nothing to do. Unfortunately, it is often the case where these additional participants are obligated to be on the call for various reasons. The basic idea is to hire a person to pretend to be you during the conference. Obviously, there is a problem here, in that the proxy will not sound the same as you (unless you happen to sound exactly like a robot). “This is YOUR_NAME, I’m on the call.” Note: do not actually say the literal word “YOUR_NAME” or the gig will be up. This set of audio clips is then hooked up to a soundboard (a keyboard—probably a virtual one—where each keypress plays a specific audio clip), which the proxy can use to respond to questions on your behalf. See Figure 1. Fig 1: Generally, most responses can be short and agreeable. The soundboard sample above contains only four of the possible dozens of things that the meeting attendance proxy can say. There is one serious problem: it is unlikely, but the person who is being represented by the proxy may be asked a difficult question that the proxy has no way to reply to. To solve this situation, we will add a “panic button” to the soundboard. This button will play a prerecorded message indicating that there is an emergency situation requiring disconnection from the conference call. The proxy will then notify the actual attendee (who is presumably on standby for just such a situation). Then the actual attendee can call right back in and answer the question correctly. Fig 2: If there’s some question that your teleconference-proxy can’t field, the proxy will press the panic button (labeled with a “?”) to disconnect with a pre-recorded socially-appropriate message (“Oh, I’m losing my connection.” “Dang, a crocodile is chewing on my leg.” etc…). This is a great idea that will improve the lives of both the office workers in question and the call-center employees who will work as proxies. PROS: This proposal could save over a billion hours of meeting time every year, allowing office workers to view over 100 billion additional cat videos per year, and possibly contributing to the GDP due to the increased ad revenue on those cat videos. CONS: Results not guaranteed. May result in job loss. “Warning” stickers / “caution” tape are occasionally placed on or around objects to indicate that they are dangerous. However: what if the tape itself is the source of danger? For example, if a roll of “BIOHAZARD” tape was accidentally dipped in a vat of bubonic plague, there would be no way to indicate that the roll of tape itself was dangerous. People would just naturally assume that the “BIOHAZARD” warnings on the tape were meant to be peeled off and stuck elsewhere, and then they would presumably handle the roll of tape, lick their fingers, and get the plague. Fig 1: A roll of “biohazard” stickers. But what if the roll ITSELF is the biohazard? Whoa. Instead of selling warning tape / stickers in completed form, they could be sold in separate rolls that would have to be combined to form the full “danger” message. One could imagine, for example, a “DANGER” sign that came in two parts (a “DAN” and a “GER,” neither of which is a warning by itself). Fig 2: Half-biohazard tape, left side. Fig 3: Half-biohazard tape, right side. Combine this with the roll in Figure 2 to form a proper biohazard sticker. 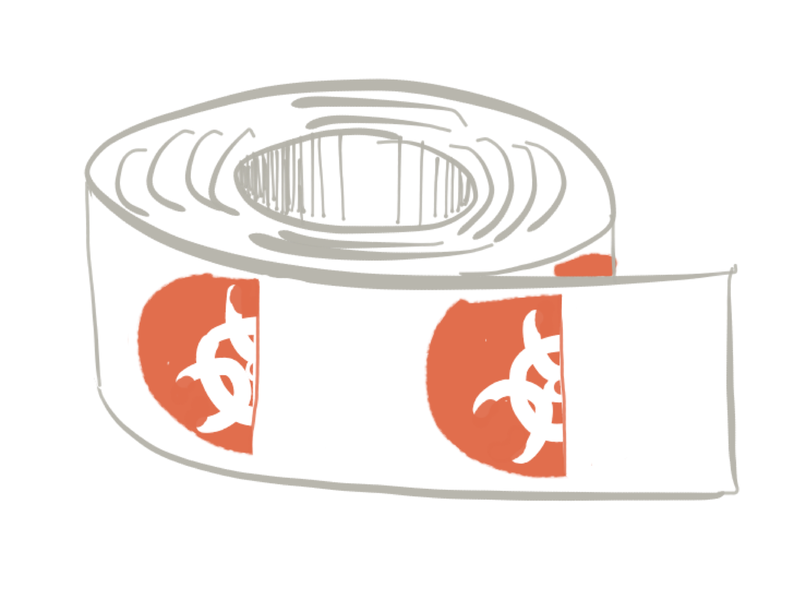 Every year, millions of people die after handling rolls of warning tape (possibly of unrelated causes). Perhaps this proposal will somehow help? 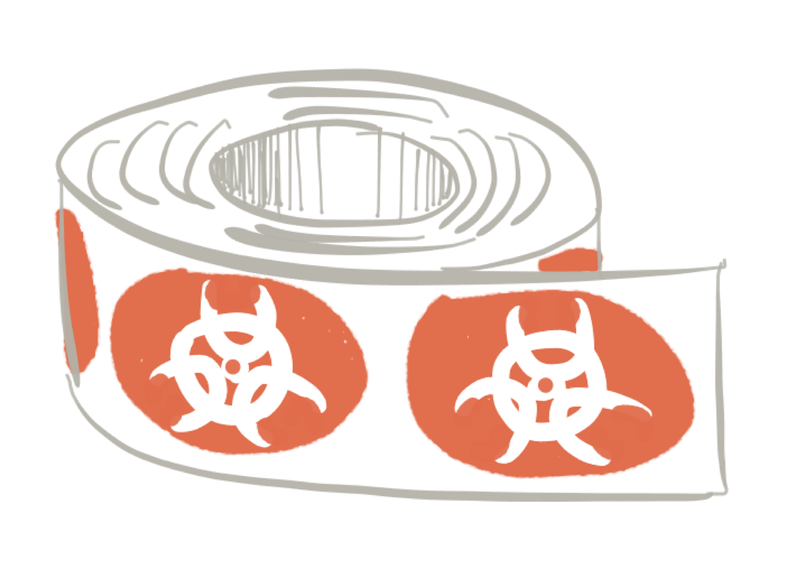 PROS: Could double profits from selling rolls of biohazard tape? If you own a tape-manufacturing company, you should lobby for this to be a new law. CONS: May be less ecologically friendly due to potentially generating extra waste. P.S. See also: a related idea for caution tape. Lose Weight With this One Weird Tip. The tip is: take one meal and eat it as two! Note: may lead to starvation if your meals are insufficiently large, but this is probably not a problem if you have an Internet connection and are reading this article. Unless you are reading it on a stone tablet in a post-apocalyptic wasteland. In which case: let me offer my condolences! Sorry we ruined the world, future person! It’s difficult for most animals to lose weight when delicious food is available at all time. Historically speaking, the problem in nature has always been one of not enough food. But we live in an era of decadence, and must make do. When going out to a restaurant, one often gets halfway through a meal and is more or less full, but there is still what seems like an entire plate of food remaining. The most obvious solution to this problem is to continue eating. But this makes it very easy to over-eat. Fig 1: If the to-go box arrived at the same time as the meal, it would be easy for a diner to avoid devouring their entire meal at once. By not devouring an entire enormous portion, the diner’s health would potentially be improved. PROS: Clearly, this would lead to improved health and well-being for all individuals. CONS: It’s possible that the slightly changed mass distribution on Earth as a result of this proposal would have a subtle effect on Earth’s orbit, which might cause it to be hit be a giant asteroid that it would have otherwise avoided.